Penta el Zero M prepares to swing a chair at Yerberia Cultura. Hallowmania returns to Brownsville on Oct. 21 at the Jacob Brown Auditorium, and the main event is set: lucha libre superstars Penta el Zero M and his brother Rey Fenix, better known collectively as the Lucha Brothers, will be squaring off against The Mechawolf and Ultimo Ninja. The Hallowmania 9 card will also include Willie Mack, Laredo Kid, Hijo de Fishman, Keira, Ivelisse, Ciclon Ramirez Jr., Canek Jr., and Eso el Payaso. Penta has been all over the place these past few years, and most recently competed at the PWG Battle of Los Angeles 2017 in August, a showcase event for the biggest stars of independent wrestling. He faced former WWE star Matt Sydal and former UFC standout and current Scenic City Invitational winner Matt Riddle there. Penta previously wrestled here in the Rio Grande Valley earlier this year at events promoted by Promociones Salinas and Lucha Powerhouse. This upcoming event is his return to the borderlands of South Texas. I had the chance to speak to Penta about his career, his favorite wrestlers growing up, the state of wrestling today, and what he thinks of the Rio Grande Valley. Note: This interview was conducted in Spanish, and this is the English translation of our conversation. 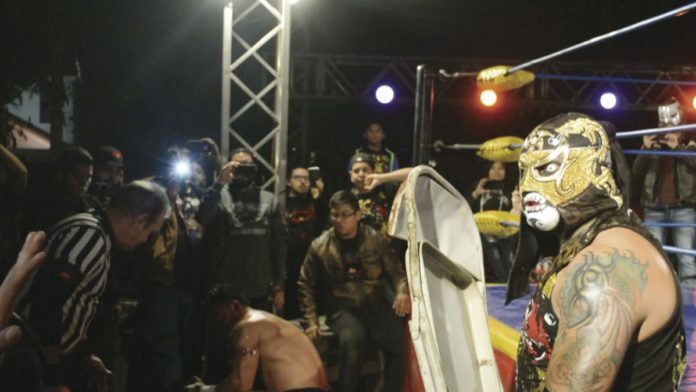 Eduardo Martinez: Why did you decide to leave (major lucha libre Mexican promotion) AAA? Penta el Zero M: Because basically I want to be looking for other horizons, I want to explore and stand out more (in the wrestling world). Being in AAA has limited us a lot. So I wanted to embark on this new journey to grow more, professionally speaking. EM: Do you have a favorite memory from your time in AAA? PeZM: I always enjoyed all my wrestling matches. Wrestling, what happens in the ring is different from what happens outside of the ring. EM: Who were your favorite luchadores when you were a kid? PeZM: In my time my favorites were Fuerza Guerrera, the one who nowadays goes by L.A. Park. (Note: L.A. Park is the original La Parka, who went by that name in the early days of AAA and late 1990s WCW. He changed his name in the 2000s to L.A. Park for copyright reasons, and now AAA has someone else using the La Parka name), Canek, the idols of the moment then like Rey Mysterio, Pierroth, Octagon. Those were some of the luchadores that were my idols. EM: Who do you think are the best luchadores in Mexico? Where do you think Mexico stands are far as talent? we are working on this side (of the border), and how much the people love Mexican wrestling, so I think that speaks well of the Mexican luchador. EM: So the last few years you’ve been wrestling a lot in the American independent wrestling scene. I’ve seen you wrestle Chris Hero in matches that I’ve liked a lot, and many others. What are your thoughts on the American independent wrestlers and scene you’ve encountered? PeZM: I think I’ve faced the best that the American independent wrestling scene has to offer, like Chris Hero, Sami Callihan, RVD, Ricochet, Raymond Rowe, Zack Sabre Jr., Will Ospreay, and so many other names that I’ve left out. So many people with who have built their great names and showcased their great talent. Also Rey Mysterio and Alberto el Patron, I feel like I’ve been in the ring with the best in the world, when it comes to lucha libre. EM: You’ve become a regular here in the Rio Grande Valley, can you tell us what your impressions have been so far? PeZM: The people here have always received us very well, the people here are great, here and all of Texas. And that motivates us to give one-hundred percent up there in the ring.